Grab your favorite mug, fill it with delicious tea or coffee and enjoy this video interview we just created on the topic of “Living SMALL In A big World”. In it, a lot is covered from how we converted our closet into a master bedroom, to living in a 125 sqft pop up tent trailer in Baja with our 12 year old daughter, to designing your home to reflect your personal connection and love with nature, to the role of straw bale construction in the tiny house movement, and how to create your own off-grid forever home with your own two hands. Living SMALL In A big World from Gabriella Morrison on Vimeo. 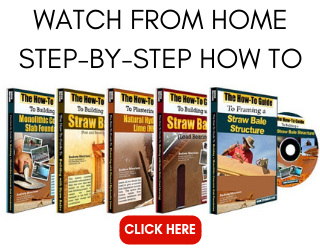 Want a Free Copy of My New Straw Bale Book? Seven years ago we went through exactly the same process of downsizing. We lived in tents and an air mattress for six months. Every morning we looked out onto the most wonderful lagoon. We returned to the city and eventually built a 400sq foot cob cottage in a very affluent suburb of Johannesburg South Africa. The existing house on a quarter of the property pays most of the bond. We have tried to maintain the outdoor lifestyle by having no closing doors, just canvas. We grow vegies and live simply. Hubby still has his high power job, but we could be self-sufficient as soon as we complete two more cottages and rent them out. Andrew, thank you as always for this thoughtful look at “stuff” and how it affects our lives and families. We are on this journey as well, having done two major stuff purges in the last couple of years. Now we are in the “how to purchase a piece of land” phase, in a state where land is at a premium and we have no credit and not much money! I am certain that many others are in our shoes. I still have your original dvd building set and still am hoping. Currently, we live in an old trailer in a nice-ish park in VT, but what we had hoped to fix and stay in is quickly becoming an albatross of never-ending new repairs. But, we’ll get there – small piece of land, small home, close neighbors. The new American Dream? OK, Onward! Great insight Andrew! I enjoyed your workshop in Zuni, NM and the video. I have come to some of the same conclusions on living, especially since I started living in a 1986 toyota van. Amazing how little one needs to live a happy and full life. Sorry to hear you got rid of the climbing gear. Could’ve done some climbing together. I have been on your email list for a few years now. I just watched your vid. Living SMALL In A big World. I had no idea you were a philosopher and psychologist as well as a straw bale expert. I couldn’t agree with you more on everything you said. This has been one of my central life philosophies for many years. When I moved to Coos Bay 22 years ago I had a similar transformation as you describe getting rid of everything I didn’t need. For the next 10 years I lived in a 400 sq. ft. cottage. I now live in an 800 sq. ft. house which is built almost entirely with salvage material. I recently attended a solar and green building tour here in Coos County. One of the houses we visited was a 500 sq. ft. straw bale. I was most interested in this house and commented to the group that the best thing about it was it’s size. This comment got no perceptible response from the group. What I saw was mostly blank stares. I recently retired from a 45 year building career. I was a licensed general contractor in Or. for 20 years and for the last 8 years an Or. Certified home & building inspector. I have studied all kinds of alternative building methods for most of my life, and finally settled on straw bale as the most viable method. Anyway, just wanted to knowledge you for your philosophy and what you are promoting and teaching. Thank you! I’m glad you landed on straw bale and that you see the amazing value in simplification. Thanks for being a part of something so small and thus so big. I agree with the utilization of space and the need to reconnect with family and community. I also feel it is important to consider your whole environment. Say water catchment systems, gray water systems, and a very big one is edible landscaping. Why just decorate, make what you plant, water and maintain, reuse the water and give you food. Plant a tree that supplies nuts or fruit, bushes that give you berries, landscape with herbs and useful flowers. Our homes are an environment, make it thoughtful. Thank you Andrew and Gabriella. This is something I will share with others for sure. Very articulate. Yes, very well done! Thanks for the inspiration. Thanks for the courage. And thanks for the “Light”-ness. You guys rock!!! Andrew, let me suggestto seriously consider a concept that I am working on, based on my favorite charity Kiva.org : we all met you and each other at your workshops and have become close (we trusted each other with dangerous weapons/tools), so, would it be really to far out to suggest to pool our money by sending i.e. $500 each to the person who is building the next straw bale house -considering it a donation – but maybe receiving ourselves $500 in return when we are building ours? This is what happened with Kiva, we were surprised that our donations were paid back. In fact the “loan default rate” if you can call it being a charity was less than 2% over all these years. Here we are in the double digits. Let’s kick this idea around…let me know what you all think. Yes Sherrie, YES! You are right on. I actually had some stuff in the interview about just that, but it didn’t make the final cut. I totally agree with you. Thanks John!!! Love to you my friend and to Nicole. Hi Petra. 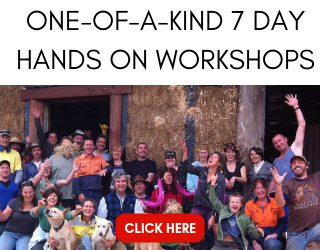 Isn’t it interesting how things shift once you step outside of the “stuff?” Your idea on paying forward (literally) within the straw bale world is interesting, but I don’t think it’s something I can spearhead as the leader of the workshops. I think it might seem too pyramidish if I presented it. Petra, I’m not fully getting the concept you’re putting forward. I’ll research Kiva and see if I can get more understanding. Thank you Gabriella and Andrew for sharing your journey of learning to live with less stuff and your experience living in the popup tent. Though we’ve never really had lots of things, we’ll be in a small camper trailer for some time while we build a house, so that story is inspiring for us. You’re welcome. I will say that I LOVE the pop tent trailer every time I get back in it. It is such a sweet space. Hi Morisson Family! Thanks for this post. It is really hard to describe to family members my reasons for wanting to go small. They seem to think I am “out of my mind” or possibly suicidal (LOL) for wanting to get rid of all my stuff. My family thinks bigger means you have made it. I have down sized twice already and spent the summer in my camper. I live up North (snow) and had to give up my nomadic life for the season. I miss it. I am having a very difficult time finding land that will allow housing under 1000 sq feet. I would be content with around 250. Codes and ordinances frustrate me. Heck, I would be content with a gypsy wagon really. A strawbale would be high class in my book (and soooo cozy). I would love to see someone meld strawbale with yurt. I can see that being very inexpensive yet sturdy… Less noisy and yet somewhat portable if needed. Just an idea. Thanks for all you guys do! Hi Stacie. You point out two of the major “issues” with living small: family who thinks we’re crazy and codes that don’t allow it. I hope that, in time, both will wash away and both family and code officials will see the value in living small. I have built yurt style structures with bales in the past. They are amazing, yet not very portable. Bale walls are so heavy that it’s hard to move them once in place. Perhaps if the whole set up was small enough to fit on a trailer it would work…food for thought! What a truly inspiring and refreshing video. I really liked your stance on finding a balance between the natural setting that surrounds your home and efficiency. There seems to be too much of a push towards one end of the spectrum or the other…when finding the center of the two is typically the best approach. 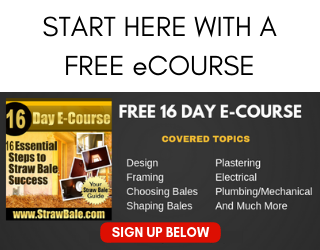 I have been fascinated with straw bale construction but have yet to experience it first hand. I am currently searching for land to purchase so that I can begin my journey into building my own straw bale home. Andrew, I’m hoping that one of these days you can come to West Virginia and lead a workshop for me. Hi Justin. Thanks for your feedback. I have some good news…I’m coming to West Virginia to teach a workshop this spring!!! I’m announcing the dates and locations on November 23rd so stay tuned. I look forward to meeting you soon. Andrew, You have once again inspired me to downsize. As I was watching your video I was looking around in my immediate space and found at least a dozen things to rid myself of. Thank you for your inspiration, hard work, in 2010 and now. You are doing a good thing for our planet. Keep up the good work. Thanks Jan. I just watched the hosting video we have on our website yesterday (the link was broken so I had to update it). It was great to see you there talking about your workshop experience. It’s great that you write now as I wanted to ask how the house is coming. Perfect timing! Andrew, Too many connections to get into at the moment but felt I had to write to thank you so much for the “Living Small….” video. Great presentation and so much wisdom. I kept thinking, “his beard needs more white in it.” As a Virginian, I’m interested in attending the workshop in WV if possible. Keep me posted and thanks again. Katya and I have recently downsized to a 500 sq ft rental situation in a new town from an 850 sq ft condo in way too busy Vancouver, B.C. You’re bang on that small spaces make imperative better interpersonal communications. Thanks Brian. Great to hear from you guys. I think you’ll find that some more detailed planning can get you where you want to be. It may be more like 750 SF for you, and that’s fine too. I just hope that people really look at what they need to live comfortably and realize it is a lot LESS than what we have been made to believe. A wonderful presentation; thanks for sharing. It looks and sounds like you’ve really thought out and prioritized what you value most in life and adjusted inwardly and outwardly accordingly. No feeling of being “stuck” through such a process, I imagine! Congratulations! THanks Michael. It has been and continues to be an amazing journey. Hope you are well. Once again, your genuine, grounded, authentic message is subtle yet very empowering. I love listening to you and still want to do a workshop with you one day, even tho I already have built my own straw bale house. Congratulations on living small for the 5 months and what a gift to give your daughter – that which money cannot buy – the love and time that so many kids don’t get from their parents these days. Keep up the awesome work – I love reading your posts and look forward to the day when our paths cross! Thank you for sharing from your heart and family to other hearts and families. You have stated it clearly and given hope for change in our lifestyes and debt loads. We can live affordably and happily of a fraction of what we think we need and be better for it. Why do we stress ourselves out over all these possessions, homes and indebtedness and lose our families in the process. Our 6 children did best when the girls all shared a room and the boys all shared a room and there was less ‘junque’to maintain. Now am ready to down-size; re-size for better living and more time for giving. I sometimes wonder if that’s why people secretly yearn for the log cabin pioneer days with relish.